Pass Line Bet – Learn this first! Online Craps versus Live Craps: Is Playing Online Safe and Fair? Should I Download Craps & Play for Money? Casino Bonuses : What you Need to Know! At CrapsPit you will learn how to play craps and apply what you learn when you play craps online or offline, in order to enjoy a safe craps game. Unlike reading the article about craps on wikipedia, here you will find a lot of information covering many aspects of the game of craps such as: the craps table layout, craps math, casino bonuses, how to calculate the house advantage when playing craps, understanding distribution variance, when and how to tip the dealers, different craps bets such as the “pass-line bets” “come & don’t come”, money management system, gambler’s fallacy & many more topics that we are sure you will find very helpful and it is available to you for FREE. 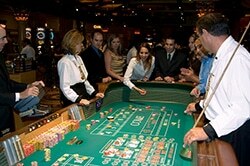 The game of craps has one of the best odds for players in the casino gaming world, second only, to Blackjack. It is perhaps intimidating for a new player with all that goes on at the table. However, it is actually not that hard to learn to play once you have read the information provided here at CrapsPit. If you like blackjack you can head check CountingEdge.com but we hope you stick around here & learn to play craps instead! Ready to drop your hard-earned money at the craps table for a chance to win money? Let me explain why playing online craps at an online casino is the ideal mechanism for getting over your fear and developing rock-solid playing habits. If you play online craps, you must accept the fact that you have a fair chance of losing money. Casinos are in business to make a profit, and they make huge profits off people who don’t know what they’re doing. Even as a knowledgeable player (which you’ll be after learning all the lessons in our articles posted on the site for FREE), you’re still a slight mathematical underdog against the casino. You must understand and accept that fact before you play online craps or any other casino game. We have added a free craps game, check it out! As you will learn from our articles about house advantage and distribution variance (click on craps math link above), you can, indeed, beat the casino win money if you limit your play. By reading the information we have on the site you will learn how to play craps in no time! By treating the game of craps as a form of entertainment, you can sufficiently limit your play to take advantage of the distribution variance, which is our only weapon against the casino. If you treat craps as a way to earn a living, or if it becomes a habit where you play craps all day every day, then you’re going to be a net loser after a long period of time. That’s just a simple statistical fact. So, treat your craps play as occasional entertainment, not as a daily chore. For example, you probably don’t go to a Broadway-style show every night. If you’re like me, you don’t go out with your spouse for a nice dinner every night. Likewise, if you treat craps as entertainment, your play will be limited to once every week or two. The point is to treat it as a periodic leisurely activity, not as a job. That way, when you hit those distribution variances and quadruple your money, you won’t give it all right back three hours later. Even if you know how to play craps, never approach a craps table expecting to win real money. You can hope to win money, but you should never expect it. Expecting to win only leads to disappointment, frustration, and sometimes depression. Hoping to win can add to the fun and excitement, but always know that the game is designed for us to lose. No matter how hard you hope, it won’t have any affect on the dice. The range of emotion that you experience when playing craps is what makes it so exciting. One minute, you’re jumping up and down screaming with joy because the variance is perfectly aligned with you, and the next minute you’re groaning because the dice just won’t cooperate. The fun and excitement that the game provides is why you should play, not because of a false expectation that you’ll get rich. Don’t take the game so seriously that it’s no longer fun. Having the proper attitude when playing craps is vital. Never play expecting to walk away a winner. Otherwise, you’ll ruin your day by getting mad or frustrated because you couldn’t beat a game that you were never supposed to beat (applies to all casino games). However, if you know all about craps, you can at least improve your odds of winning and this we can help you accomplish. Please do not cheat at the casinos! Are you ready to play craps online? I recommend you play at this casino for the best online craps experience. CLICK HERE It is the casino I like to play at so not reason why you would not like it too, we are like minded! What happens to come bets when the passline point wins? Use 20FREECRAPS in the casino cashier to get $20 added to your player account. I also added a free craps game. Play Craps online for fun or for real money at Casino MAX. 150% up to $1,500 Free using code MAX150. I love playing on my smartphone, no reason why you wouldn't. Check it out! Play Craps online for fun or for real money at MY favorite online craps casino. The Bonus is a no-brainer. I love it! Check it out and play for free first. I bet you will like it too. We are the #1 Craps Site! By visiting the casinos we recommend it costs you nothing & it helps us grow Crapspit.org to serve you more content. Are you willing to help us grow? Open an Account today!